Five players have been shortlisted for the Premier League 2 Player of the Month award for November. 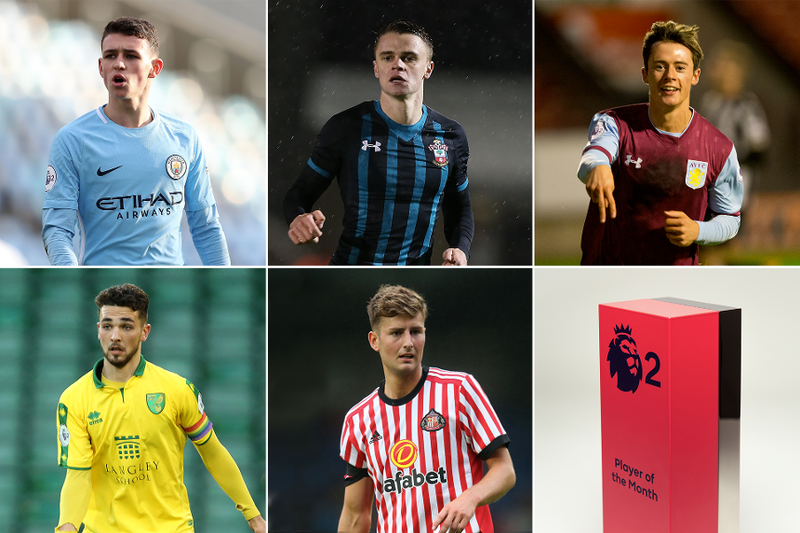 Harry McKirdy (Aston Villa), Adam Phillips (Norwich), Jake Hesketh (Southampton), Ethan Robson (Sunderland) and Phil Foden (Manchester City) have been selected by the Premier League Football Development panel after PL2 club managers nominated the best individual performance from each of their opponents during the month. The winner will be chosen by the same panel and will be announced on 15 December. The 17-year-old winger got one goal from his two PL2 appearances. He also made his UEFA Champions League debut last month. The 21-year-old midfielder struck four goals in three appearances in PL2 and the Checkatrade Trophy. The 20-year-old forward impressed in both his PL2 matches last month, scoring one goal. The 19-year-old midfielder, signed from Liverpool in the summer, got one goal from three appearances, two in PL2 and one in the PL Cup. The 21-year-old midfielder earns his nomination after playing in a variety of competitions for Sunderland last month, including PL2, PL Cup, PL International Cup and Checkatrade Trophy.